I was rather under whelmed by the storytelling in Can Evrenol's Baskin (review) and though the movie certainly pushed the boundaries of shock horror, it didn't have much in the way of staying power. Last year, Evrenol returned to the genre festival circuit with Housewife which seems to have a little more meat to the story though it remains to be seen if it'll be more memorable than Baskin. French actress Clementine Poidatz stars as Holly, a young wife who is still dealing with the psychological trauma of the brutal murder of her father and younger sister at the hands of her mother. At the insistence of her friends, Holly meets with a charismatic cult leader named Bruce O'Hara (David Sakurai) who embarks her on a journey to come to grips with the 20-year-old trauma that still plagues her. What I like most about the newly minted trailer (the first trailer wasn't bad either) is that that it features some really striking visuals not to mention, I'm getting some serious Brian De Palma vibes which is definitely a good thing. 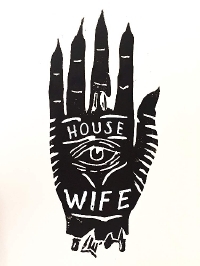 Housewife will be available on DVD, VOD and Digital HD on October 2.